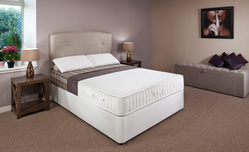 All British made beds we sell a fine selection of very comfy quality upholstered double divan beds handmade for you in our Glasgow workshop. 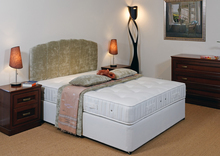 We have an excellent choice of 4ft 6in wide double beds in a variety of different levels of support. 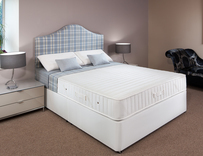 Our selection has been carefully put together to ensure there is a double divan bed to suit everyone whatever their size, weight and personal preferences including soft, medium, firm, extra firm and hard grades of support to give you the best night's sleep possible from your bed. All of our contemporary double divans come with various storage options - 2 drawers 1 at each side, 4 drawers, a jumbo drawer, 1/2 ottoman or 1/2 ottoman with 2 drawers. 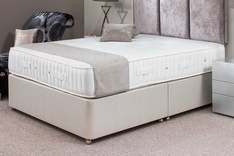 If you are looking for something a little bit different any of our double divan beds can come in a choice of colours other than white or cream; just contact our sales staff at sales@robinsonsbeds.co.uk or telephone 0141 632 1384 and we will make it for you in our bed workshop. 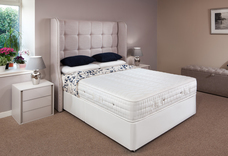 Visit our Glasgow showroom to see our range of double divan beds, double divan storage beds, double ottoman divans, and upholstered divan beds in many different materials and colours with a great choice of upholstered headboards to match. As we also supply interior designers, the rental market and the hotel trade you can be sure of the quality and reliability of our products. 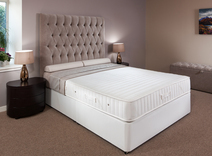 All our divan beds can be delivered UK wide. 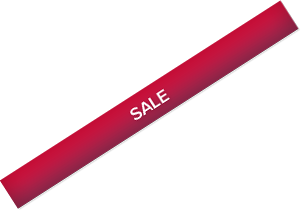 We deliver to London, Edinburgh, Manchester, Birmingham, Liverpool, Newcastle, Cardiff, Glasgow, Aberdeen, Kent, Surrey, Sussex, Suffolk, Hertfordshire, Bedfordshire, Buckinghamshire, Oxfordshire, Cambridgeshire, Lincolnshire, Wiltshire, Hampshire, Dorset, Devon and the South West, Cheshire, the Midlands, East Anglia and the North West of England.